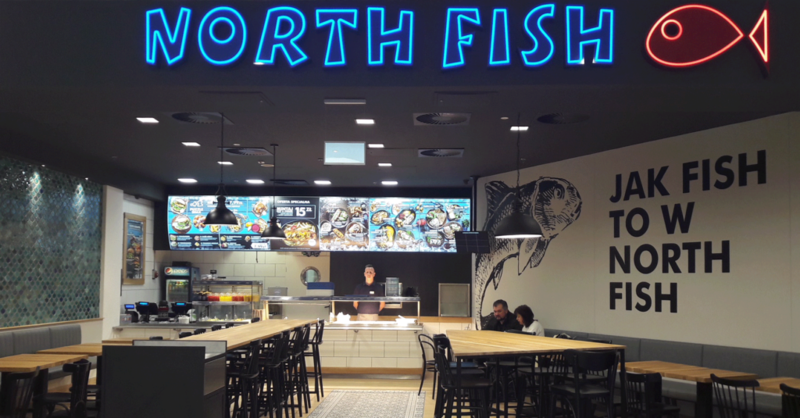 On February 4, after a week long redesigning we have reopened the North Fish restaurant in Galeria Krakowska located next to the Central Station. The restaurant has now a modern and sophisticated look. Unique fish scales on the walls, multi-format graphics, the plants, as well as decorations gave the dining room interior fresh and unique character. The restaurant will enchant both our regular and new guests, the visitors of Galeria Krakowska and travellers at the Central Station. “New cosy room, menu revised every season and friendly staff will allow our guests to spend unforgettable moments in the restaurant. Hand-made fish scales will remind you about the main ingredient of our success. Comfortable chairs and sofas provide a pleasant rest after a hearty meal” – says Alicja Lech, Restaurant Manager at North Fish Restaurant located on level -1 in Galeria Krakowska. North Fish Restaurant serves meals that are well known by our guests. You will find tasty fish and seafood, delicious sandwiches with home-made rolls, soups and always fresh preservative-free smoothies and lemonades.